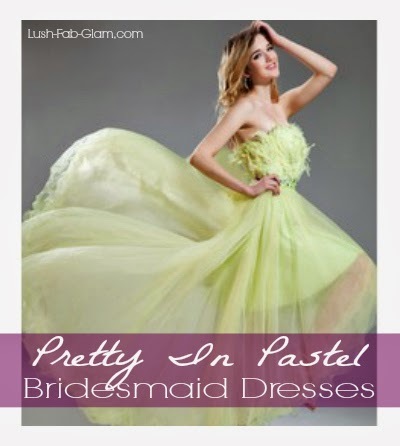 Lush Fab Glam Inspired Lifestyle For The Modern Woman: Pretty In Pastel Bridesmaid Dresses For A Spring Wedding. Pretty In Pastel Bridesmaid Dresses For A Spring Wedding. Spring is finally here and the official start of the spring/summer wedding season is only two weeks away. That means crunch time for Brides-to-be and their bridesmaids as they finalize the details of their wedding day and go on the hunt for gorgeous bridesmaids dresses in pretty pastel and spring colors. Read on for tips to help you choose the perfect bridesmaid dress. Plus see 10 gorgeous bridesmaids dresses in beautiful butter cream and lemon yellow, sky blue, lavender, blush pink and more. That will add a touch of elegance and glamour to any wedding celebration, without blowing your budget. 1. Color: Pretty pastel hues are the perfect way to add color to your spring or summer wedding event without it being over-the-top. 2. Design: Choose a beautiful design that can be worn again. Whether it's to attend another wedding as a guest, to an evening soiree or to a party later in the year. 3. 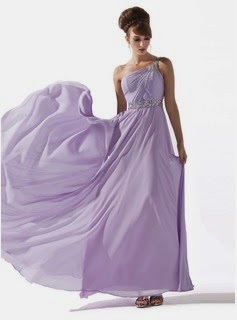 Fit: Women come in all shapes and sizes and the choice of the perfect dress may be different for each bridesmaid. If you want all your bridesmaids wearing the same dress design and color there are styles that flatter all figures like the one shoulder Greek Goddess dress shown in the first photo below. You can also let your bridesmaids pick dresses in the same color but with different designs that flatters their unique shape. 4. Price: Weddings are very expensive not just for the engaged couple but also for the bridesmaids. The cost for hair, makeup, gifts for the bride and groom, jewelry and shoes quickly add up. So it's important to find a beautiful bridesmaid dress that's affordable like the ones featured below from JenJenHouse.com. Editor's Picks: Below are 10 gorgeous dresses in pretty pastel colors and designs that we love and you will too. Choose your favorite bridesmaid dress for your picture perfect bridal party. Which featured spring wedding and bridesmaid dress do you love? Share with us by leaving a comment below. Love the last dress. So pretty!